Your clients expect to get the products they want the moment they want them. If they aren’t able to swing by the salon to get their favorite item, they need to have an opportunity to purchase online or you risk having them choose an alternative product – and maybe even another salon. We want to help close the loop and make sure you benefit from any purchase of SEVEN® products that your clients make, so we’ve set up an Online Partner Program to do just that. How do I log in to the program? Using the program is very easy! See the below how-to video as well as instructions. When you sign up, an email is sent with your Username and a temporary Password. Important: You’ll want to reset your password by clicking on the link in the email. 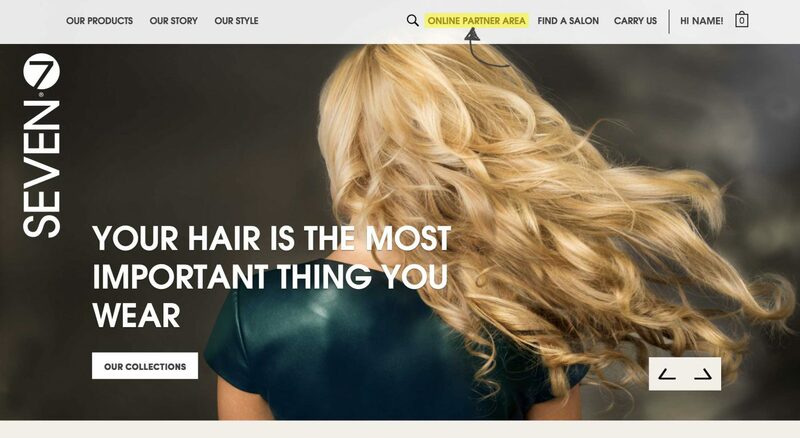 Every time you login to your account on 7haircare.com, you’ll see an “Your Online Partner Area” appear in the top navigation bar. You will not be able to access the Online Partner Area without logging in. As an Online Partner of SEVEN® you are given a unique affiliate referral number. This number is encoded in a URL or Creatives provided in your Online Partner Area of the 7haircare.com site. You’ll share those URLs and Creatives on your website, in emails or in social, and when your clients click through, a cookie tells us that they were referred by you. You then get credit for any purchase your clients make! Here is a sample of one of the provided Creatives – a banner for use in email or on your website. How do I generate and use my unique referral URLs? See the below how-to video as well as instructions. From the homepage, click on “Online Partner Area” in the top navigation bar. 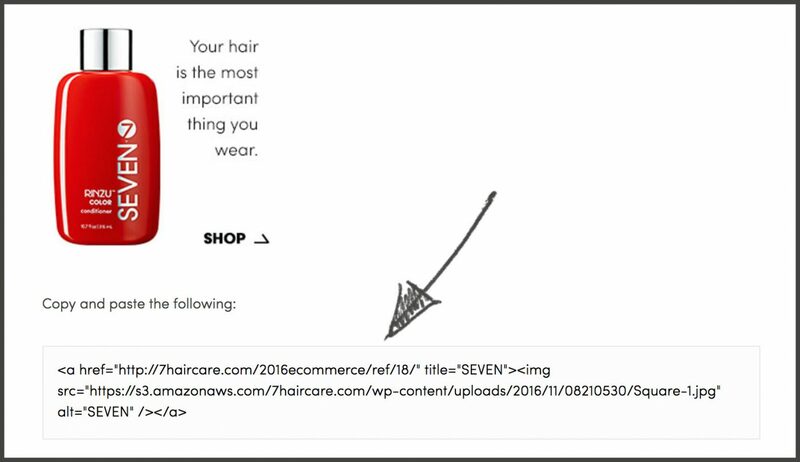 To generate a unique referral URL, paste the 7haircare.com link you’d like to send your clients to in the space provided. Hyperlink the URL provided into an email or pop it into social media. When you do, it will automatically populate with artwork. Add a note like “We use SEVEN haircare for great, healthy, workable hair every day,” and you are ready to go! How do I use my unique referral URLs on Instagram? Currently, the best way to use your unique referral URL is by adding it in the bio of your Instagram page. Simply say “see link in bio” when you post about a SEVEN product or event. That could be changing soon. We’ve got our eye on new functionality for a “shoppable” experience that Instagram is launching. Visit this page to find out more. How do I use the “Creatives” provided? Banners and artwork for you to use in your email and web platforms are provided in the “Creatives” tab in your Online Partner Area. To use, simply copy and paste the HTML code provided in your email or website platform. To get credit as an Online Partner you must use one of the URLs or Creatives provided in your Online Partner Area. Can I use my links on my website or email platform using my own images? Yes! You can use any online partner link on your website or email platform. Simple hyper link the image in the backend of the platform. What do I receive when my clients make a purchase? You’ll receive a 30% commission on retail of any purchase, excluding tax and shipping. Additionally, you can double the value of your commission when you use your credit towards backbar. That’s a 60% commission! Example: Your clients purchase $300 in product. At the end of the quarter, you receive $90 credit to your account, or $180 towards backbar. There are two ways to receive your commission. In the form of Backbar credit at the end of each quarter. In the form of a retail credit towards future salon order at the end of each quarter. *Backbar credit is the default. Please let us know if you would prefer a retail credit to your account instead by emailing info@7haircare.com. Yes. Credit expires at the end of the following quarter. Example: You receive $200 towards backbar at the end of Q1 (March 31st). You must use the credit before it expires at the end of Q2 (June 30).